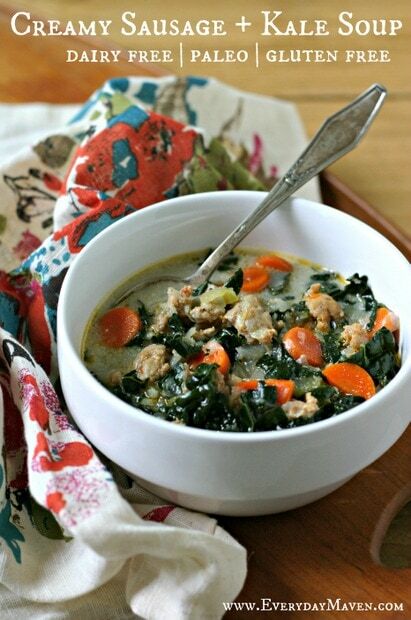 Creamy Sausage and Kale Soup. Dairy Free. Paleo. Creamy Sausage and Kale Soup. A dairy free meal in a bowl loaded with kale, carrots, sausage and coconut milk that tastes nothing like coconut! If you follow me on Instagram or Facebook, you may remember a couple of months ago I was lucky enough to head down to Portland, Oregon for a long weekend with Pacific Foods. If you aren’t familiar with Pacific Foods, they make everything from broths, stocks and my new favorite product – Organic Bone Broth to soups and non-dairy milks with a lot in between. They are based in Oregon and I have to admit that while I used a fair amount of their products prior to my trip, what I learned during the weekend I spent with them blew me away. I think it is rare to say this but Pacific Foods truly doesn’t give themselves enough credit. They are doing good work. In an environment riddled with companies overly focused on marketing and not on ethics and values, it was so refreshing to learn that Pacific Foods not only talks the talk, but walks the walk. Also, let’s be clear – they are not paying me to say this – I was seriously super impressed with how this family-owned company is doing business. For me it was the little things that made the most difference. How much Pacific Foods cares about the quality of its ingredients, how much they will NOT compromise on quality. So much so that they started their own organic dairy farm so that they could control the source of milk products (and the treatment of the animals) for their soups and other products that have milk or cream added. Things like caring about organics and NON-GMO ingredients, being committed to not only controlling their supply chain but constantly improving it. This is a big deal you guys. So many (too many actually!) companies drive their supply chain based on cost first. And, you know what that means. Low cost tends to equal lower quality. Like I said, when I went down there, I was already an occasional customer but truth be told, I still thought of them as a packaged foods company and in our house, we really try to limit our intake of packaged foods. After visiting and learning first-hand how much care is put into sourcing high-quality, GMO-Free, mostly organic ingredients, I have no hesitation in stocking my pantry with Pacific products. When it comes to prepared food, I am not sure if there is much higher quality out there. As soon as I got back, I started experimenting with one of their newest products – Organic Chicken Bone Broth. You know I like to make at least one big pot of soup per week in the cooler months and even though I try to keep my freezer stocked with a variety of my homemade broths (Chicken, Beef, Shrimp, Flu Fighter Stock), it’s sometimes just hard to keep up. Having a high-quality product that I can rely on as a base for my soups is a big deal and I am loving the Organic Bone Broth. There are only 5 ingredients – Water, Organic Chicken, Organic Onion, Organic Apple Cider Vinegar and Organic Rosemary Extract and it’s sodium free so it makes a very versatile base for a variety of different soups, stews and chili’s. A huge thank you to Pacific Foods for a wonderful and very informative weekend and for sending me a ton of Organic Bone Broth to play around with. I have made many soups with it that I can’t wait to share – this is the first one I’ve had time to re-make and photography for everyone. 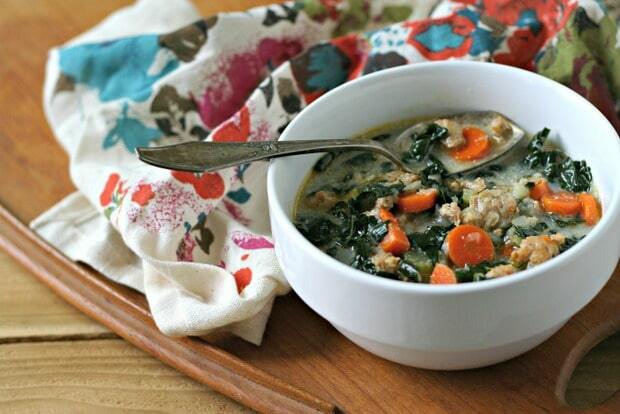 Now for the recipe – this Creamy Sausage and Kale Soup is Dairy Free, Gluten Free and Paleo. Loaded with kale, carrots and chunks of spicy sausage, it is a meal in a bowl. While there is coconut milk, there is no taste anywhere of coconut milk. It’s just lusciously creamy and rich. Plus, it freezes great! I used Pacific Foods Organic Chicken Bone Broth which is very low in sodium. If you use a homemade stock or other prepared broth, please adjust the salt accordingly. Always start with less as it’s easy to keep adding a bit more but very hard to fix the soup if it’s too salty! When I talk about stemming the Kale, I am referring to pulling the leaves off the stems. This is the quickest method, don’t waste time using a knife to cut the leaves off or pulling off one by one. DISCLOSURE: All elements of my trip were hosted and arranged by Pacific Foods. Finely chop garlic and onion. Or use the food processor to save time! Peel carrots and cut into 1/8" rounds. Cut celery into 1/8" half-moons. Remove sausage from casings (if in casings). Measure spices. Clean kale, remove stems and chop into bite sized pieces. Heat a large soup pot over medium heat. Once hot, add oil then chopped garlic, onion and spices (salt, fennel, black pepper, red pepper). Cook 8 to 10 minutes, stirring occasionally, until onions are soft and spices are fragrant. Add crumbled sausage and use a wooden spoon or spatula to break up even further into bite sized pieces. Cook 4 to 5 minutes, stirring occasionally, until most of the pink is gone. Add carrots and celery. Sauté 2 to 3 minutes. Once boiling, add kale, cover and immediately lower heat to a simmer. Continue cooking for 8 to 10 minutes or until kale is softened. Remove from heat and discard bay leaf. Slowly stir in coconut milk until fully dissolved. Serve warm and Enjoy! Just out of curiosity, why do so many make this soup and others with Chicken Broth. I always use low sodium Beef broth which is so much tastier. Just flavor preference. Glad the beef works for you and you like the recipe! I keep making new batches of bone broth thinking I’ll try a soup next time — but I never can. This one is just too good! Thank you for a much needed bowl of comfort! My kids loved it too! This soup is absolutely delicious. I made my own seasoning for hot Italian pork sausage, added some red potatoes with the kale, and topped each bowl with some chopped bacon. So yummy! Thanks for a great recipe. You’re welcome Donna – so glad you love it! On January 11, 2016 I posted that the calorie count for this soup was 353 calories per cup. I was wrong. The correct calorie count is 282 calories per cup. I downloaded this recipe using “my fitness pal” using the “recipe” tab for a more accurate accounting. All the more reason to keep on eating this delicious soup! Thanks for the update Lorna! This recipe is sooooo delicious! I did not have fennel seeds, I added a pinch of dried oregano, but the Italian sausage had enough fennel seed to taste it in the soup! The coconut milk makes its so creamy and yummy and comforting! Love this recipe, thank you! This is absolutely delicious! I took a taste out of the pot and got a bowl for more. I will eat this everyday for lunch and won’t tire of it. There was an earlier post that asked for calories. I googled Paleo Kale and sausage soup and it said 353 calories per cup. This soup is worth every calorie. Does anyone know how many calories are in a cup of this? It is DELICIOUS btw! I am going to try this recipe today! This soup is amazing! Coconut milk is my new best friend. So glad you love it Lori! 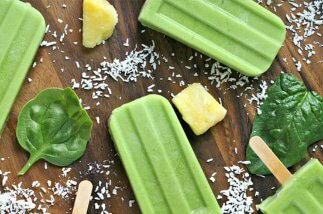 First time visitor to your site, and actually, the first time I’ve commented on a blog… But I had to say, I LOVE this recipe, and I LOVE Pacific Foods. I live in Portland and didn’t realize they were located here in Oregon, so more reason for me to head out to the store and buy some of their stock. Thank you! It turned out delicious! Definitely making more for the freezer next time. Thanks! Does the coconut milk have a coconut flavor? I don’t like coconut. I don’t think you can taste coconut at all in this dish! This is DELICIOUS!! Thank you for sharing the recipe! I will definitely look into the pacific brand as well. Excellent, excellent, excellent. Great flavors, I could hardly stop eating it! I wasn’t sure how much 1 head of the kale was (I bought it by the bunch) so I ball parked it from your photo of them chopped up. Turns out it didn’t matter, I added more anyway. Oh, I do love the sound of this soup and Pacific Foods sounds like a great company. loved reading about Pacific foods. . I already buy a lot of their broths and stocks and loved reading about your trip!!! and love this soup. I’ll be living off of kale soup this winter!! glad you’re feeling better!! Thanks Alice! Have you tried the new bone broth yet? It’s really great!